The Independence Day landing in 1997 was the first touchdown of a robot on Mars since NASA’s Viking landers arrived in 1976, and the U.S. space agency has since maintained a continuous robotic presence at the red planet, dispatching additional landers, rovers and orbiters to sample rocks, monitor Martian weather, and glimpse into the world’s warmer, wetter past. “I think Mars holds a special place in everyone’s hearts because it looks a lot like the Earth — it looks like a place we could live,” said Mike Watkins, director of NASA’s Jet Propulsion Laboratory, where engineers developed, built and operated Mars Pathfinder. Watkins said Pathfinder’s landing on Mars helped lead NASA to answer fundamental questions about Earth’s neighbor: What was its history? How did Mars get the way it is? Was it once habitable? Follow-on missions have sent rovers driving across dried-up lake and river beds, to deposits left by ancient hot springs, and orbiters that found signs of intermittent water still present on the desert planet and helped unravel how Mars became so cold and inhospitable. 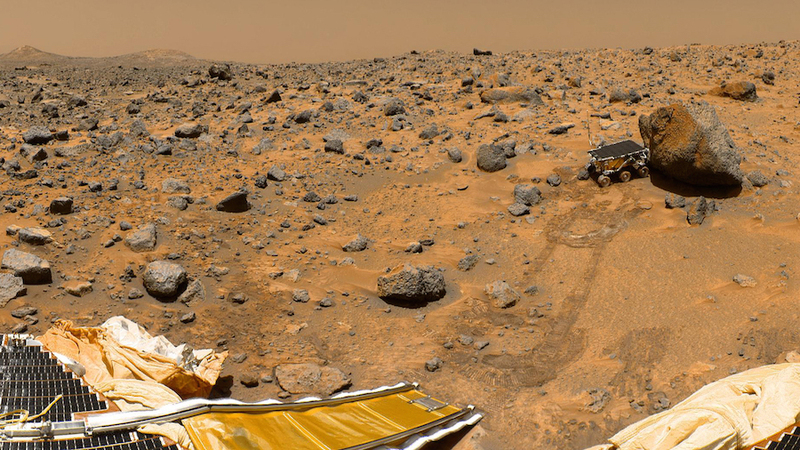 Conceived in late 1993 as NASA faced a severe budget crunch in the wake of several high-profile robotic mission mishaps, Mars Pathfinder had to fit within stringent cost and schedule limits. NASA Headquarters in Washington, at the behest of then-administrator Dan Goldin, gave engineers at JPL three years and $150 million to ready the lander for launch in December 1996. Goldin said NASA could no longer afford multibillion-dollar missions to explore the solar system in an era of nearly-flat budgets. Goldin infused his mantra of “faster, better, cheaper” across NASA’s programs, leading to the launch of fleets of smaller, less costly spacecraft to study the cosmos and visit unexplored destinations, from new regions on the Martian surface, to Mercury, Pluto, asteroids and comets. Mars Pathfinder got its start months after controllers lost contact with NASA’s $813 million Mars Observer orbiter days before it was to arrive at the red planet. But NASA’s next Mars mission, despite vastly more ambitious objectives, ended up costing about one-third the expenditure that went into Mars Observer. While Pathfinder’s team had to work within tight financial and time boxes, managers said they had freedom to innovate. In real terms, that usually meant building, breaking, then fixing a part that needed to fly on the mission. One example was a cable that engineers designed to extend below the lander during final descent to measure its altitude. That didn’t work, so designers opted for a radar to bounce signals off the Martian surface for altitude data, but that solution also proved complicated as a prototype lander swung beneath a parachute during drop testing in Earth’s atmosphere. The lander’s inflatable cushion was also tricky, but engineers needed the airbags to keep the spacecraft’s mass down, exchanging air for heavier rocket fuel to bring the robot to a rest on Mars. The Viking landers relied on retrorockets to brake for touchdown, but the airbags, in principle, were more resilient. “There were certain parts of it we came to realize you really couldn’t treat very well with a computer simulation, airbags being, by far and away, the foremost example,” said Sam Thurman, Mars Pathfinder’s entry, descent and landing system engineer at JPL. 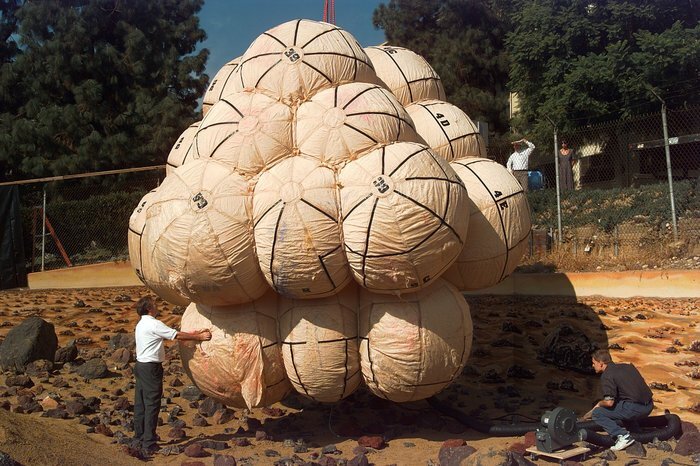 NASA sent a full-scale model of the airbags, made of a high-strength fiber called Vectran, to the Plum Brook Station in Ohio for drop tests against an inclined, rocky floor meant to mimic the Martian surface. Mission managers were finally comfortable with the airbag design in early 1996, deeming the system qualified for the trip to Mars eight months before blastoff. 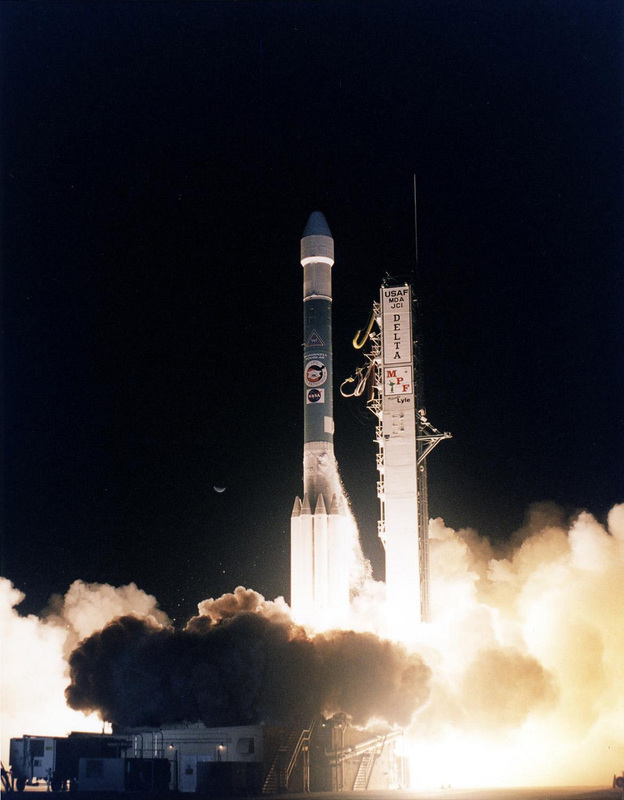 Mars Pathfinder departed Earth on Dec. 4, 1996, riding a Boeing Delta 2 rocket from Cape Canaveral on the first leg of its seven-month voyage. Unlike the Viking landers, which dropped to Mars from orbiting motherships, Pathfinder made a direct descent, slicing through the atmosphere at higher speeds than the Vikings experienced. A heat-resistant shield protected the lander during the first part of entry, then a supersonic parachute deployed, braking rockets fired and the airbags inflated before the shepherding craft cut the lander’s Kevlar bridle. Shortly before 10 a.m. PDT (1 p.m. EDT; 1700 GMT) on July 4, 1997, the lander hit the ground at about 31 mph (14 meters per second), and rebounded several stories high, bouncing at least 15 times before coming to a stop more than a half-mile (1 kilometer) from its original landing point in Ares Vallis, a rocky plain in Mars’s northern hemisphere. The airbags deflated automatically, opening Pathfinder’s flower-like petals to make way for the exit of the Sojourner rover, a six-wheeled vehicle that was not originally part of the Pathfinder mission. NASA added Sojourner after scouring the agency for money to fund it, and its cost, along with the price of the Delta 2 booster and a three-month operations budget, pushed Pathfinder’s final cost to $264 million. The Pathfinder lander soon transmitted its first signals to anxious engineers on Earth, and the first images were beamed back to the ground a few hours later. “The very first thing we wanted to do is to get those images down to see what the landing site looked like, and the rover on the petal,” said Jennifer Trosper, Pathfinder’s flight director. “I remember getting those images down, and we were printing them out on printers,” she said, in contrast to today’s smartphone and social media age. The Sojourner rover, named for American civil rights pioneer Sojourner Truth, drove down a ramp to start traversing the landing zone the day after arriving on Mars. Staying in touch with mission control via a wireless modem link with the stationary landing platform, the solar-powered rover — about the size of a microwave oven — inspected the rock-strewn region nearby, logging more than 300 feet (100 meters) on its odometer. 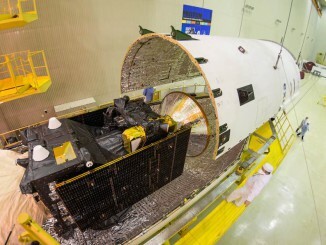 Designed to last between one week and one month, Sojourner relayed data for nearly three months until the Pathfinder landing station stopped communicating with Earth on Sept. 27. The ground team suspected the spacecraft’s battery was depleted and its internal temperature dropped below a safe level, according to a mission fact sheet posted on a NASA website. The end of Pathfinder’s mission came about two weeks after NASA’s Mars Global Surveyor spacecraft slid into orbit at the planet. 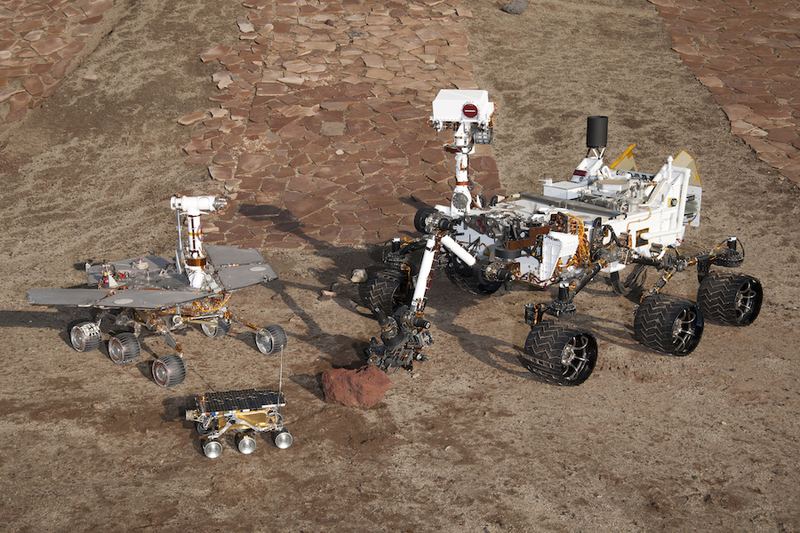 The Sojourner rover’s chassis was a forerunner to bigger vehicles, first the identical Spirit and Opportunity rovers that landed in 2004, and then the Curiosity mission that arrived in 2012. The Opportunity and Curiosity rovers are still moving across the red planet today, and another rover based on Curiosity’s frame will launch to Mars in July 2020. But the last 20 years of NASA Mars missions have not been without blemishes. NASA lost two spacecraft as they arrived at Mars in late 1999, both of which followed in the footsteps of Pathfinder, incorporating Goldin’s “faster, better, cheaper” philosophy. The Mars Climate Orbiter burned up in the Martian atmosphere as it tried to enter orbit in September 1999, an error caused by the mismatch of English units and metric units used by the craft’s navigation and operations teams. Less than three months later, the Mars Polar Lander crashed on the red planet, likely due to a premature engine shutdown. Investigators said a contributing cause of the mishaps was their tight budgets, concluding the projects were under-funded by at least 30 percent. NASA gave more money to subsequent Mars missions and added additional engineering reviews to ensure their readiness for launch. Mars scientists have had at least one operating mission at Mars every day since Pathfinder’s Independence Day descent 20 years ago. NASA’s Mars Odyssey joined Mars Global Surveyor in 2001, and the Spirit and Opportunity rovers blasted off in mid-2003, along with the European Space Agency’s first interplanetary mission, Mars Express. Odyssey, Opportunity and Mars Express are still returning scientific data — all years beyond their intended lifetimes — while Mars Global Surveyor stopped transmitting in 2006 and engineers last heard from the Spirit rover in 2010. The Mars Reconnaissance Orbiter, carrying a high-resolution mapping camera, launched in August 2005 and arrived at Mars in March 2006. 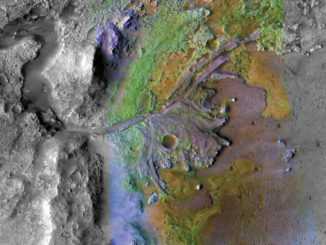 NASA is still getting data from MRO, which returns dazzling sharp-eyed views of Martian terrain. 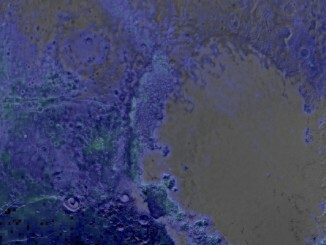 NASA’s Phoenix lander touched down on the northern polar plains of Mars in May 2008, succumbing to the extreme Martian winter in November 2008 as expected. The Curiosity rover has explored Gale Crater, an impact basin rife with geologic features like dunes, buttes and a three-mile-tall mountain, since August 2012. NASA’s MAVEN orbiter has been sampling the upper atmosphere of Mars since 2014, and India flew its first planetary mission into Martian orbit the same year. The newest arrival is ESA’s ExoMars Trace Gas Orbiter, which aims to seek the source of methane in the Martian atmosphere, a potential indicator of ongoing biological or geological activity. Many of Pathfinder’s engineers have worked on all of JPL’s Mars rovers. “One of the great legacies of Pathfinder and the Mars program is it allowed us to do engineering the way engineering is done, which is to have the same people do a mission, learn what they did right or wrong, and then do another one, and then do another one,” Watkins said. The series of missions, launching at cadences as short as every two years when the planets are properly aligned, have helped NASA “build up a knowledge base they we really haven’t had for any other planet,” Watkins said.